An American Medical Security Health Insurance Company review leads to MedHealth Insurance of which American Medical Security is a subsidiary. They have recently merged with United Wisconsin Life Insurance Company to form American Medical Security Life Insurance Company. If you are looking for personal health insurance, enter your zip code in the free box to receive rates and quotes from several companies now! 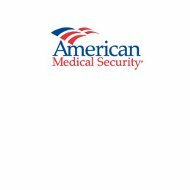 American Medical Security has a variety of plans and coverage options available for their clients. Health insurance plans and dental insurance plans are explained at length so individuals can choose the plan that is right for them and fits their monthly insurance budget. Agents work one on one with individuals and employers to customize plans. Each of these plans contain different elements so that customers can choose the plan that is right for them. MedOne Plus gives the customer the choice in everything. Customers can choose the benefits they want, the co-payment amount, and the deductible level. All of these choices determine the premium amount that will be paid. This way, customers don’t have to pay for benefits they don’t feel they need. The MedOne Security Plan offers the lowest premium amounts coupled with the highest deductible amounts. This is a good choice for healthy individuals. The MedOne HSA Savings Plan is a high deductible plan that is linked to a health savings account. Customers can choose to use the savings account option or forgo it for a cheaper premium amount. Health Savings Accounts are beneficial because they allow you to set aside money for medical expenses through your paycheck before taxes are taken out. Short-Term Medical Insurance is available for 30 days up to 180 days of coverage. Shorter periods are not allowed by law and longer periods need a different type of coverage such as temporary insurance. Short-Term Medical is good for individuals who are between jobs or involved in other types of transistions in life. Group insurance is typically offered through an employer or through an organization. Statistics show that more and more employees are basing their job choices on the benefits that come with that particular job. American Medical Security has two different types of group insurance available. Signature Freedom Group Self Directed Health Plan is for employers to offer to their employees. It is not a complete self directed plan but rather combines self directed aspects with traditional health insurance. This plan allows the employee to designate a certain amount of money per year to cover office visits, exams, immunization, and preventative care measures for employees and their families. If employees go over the amount set by the employer, they have to pay that amount out of pocket. If more serious medical issues such a diesase, long term illness, hospitalization, or on going prescriptions occur, the traditional health care benefits will kick in and be used. This saves the employer money yet still allows them to offer insurance benefits to their employees. Quality, affordable dental plans are also offered by American Medical Security. Dental insurance is important, especially for those who have families. Preventative dental care can prevent long term costly dental issues as well as diseases that stem from dental issues. American Medical Security offers both individual and group insurance plans that focus on preventative care. The group dental plan is referred to as Group DentalChoice. This plan allows employees to choose from a basic or upgraded dental plan based on family size and dental needs. It is a reimbursement plan so any dentist can be seen. Vision coverage can be added to this plan for an additonal fee. The individual dental plan is called MedOne Dental. It is only available for those who have MedOne medical insurance plan. Like the group plan, policyholders can see any dentist of their choice. There are not any waiting periods for preventative care measures. If you are someone who will need extensive dental work, there are other upgrades and riders that can be added to the MedOne Dental plan to meet your needs.